This is a seasonal dish that I have been working on for a couple of years. 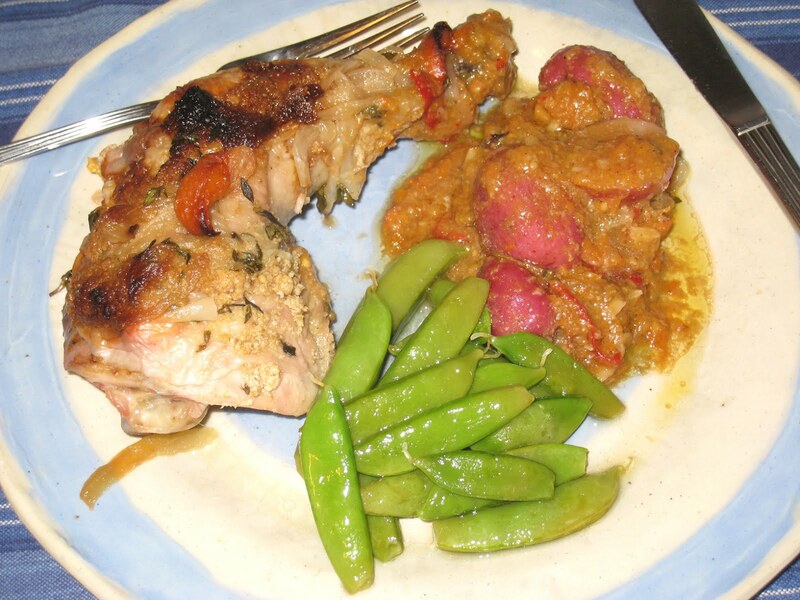 As soon as apricots come into season, I buy some and cook them with chicken and thyme. It is a good combination, with the potential to be great, but I have not yet found the perfect proportion of the ingredients to make everything shine together. This year it was close, I think. I put a layer of roughly chopped onion and a head's worth of garlic cloves in the bottom of the baking dish, then added several sprigs of fresh thyme. To that I added about a cup of sliced apricots. I seasoned with salt and pepper, then sprinkled olive oil over the top. I then had the brilliant idea of adding some of my homemade mustard, so a few tablespoons of that as well. 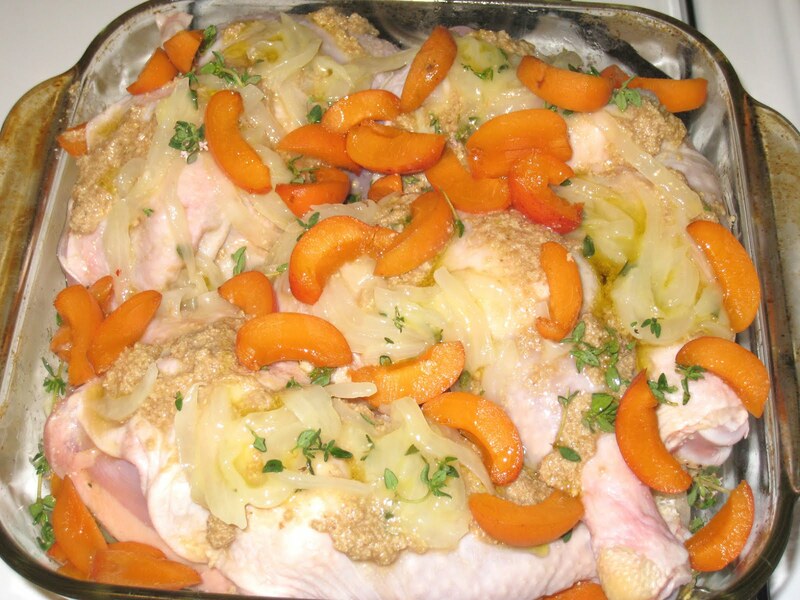 I layered the seasoned chicken (I use the leg quarters, as that is my favorite part of the chicken), and then inserted fresh thyme and sliced apricots between the skin and the meat. 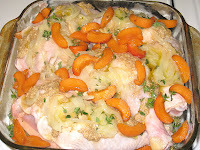 I covered the chickens with more mustard and sprinkled more thyme around the dish, then added another cup of sliced apricots. I baked the chicken at 375 deg. F. for 45 minutes, then lowered the heat to 350 deg. F. and baked for another 30 minutes, until the skin was browned and crisp. The result was good, but not great. I think the main reason I did not hit it out of the park is that I used too much of the mustard, or at the very least, did not add any honey or sugar to help offset the acidity of that particular mustard. It was a little too tart, and the flavor was overpowering instead of enhancing. It could also have used a little more thyme. I was going to add the first of the season's new potatoes to bake with the chicken, but I forgot about them until the chicken was halfway baked. Instead, I removed the onions (but not the garlic!) from the cooking liquid, put it into a saucepan, and cooked the potatoes in that. And again, the acidity from the mustard was a little too much, but it was otherwise good. And I had no trouble whatsoever eating the results of this experiment. Depending on how long the apricot season is this year, I might try it again now instead of waiting until next year. But whether it's this year or not, I believe my next attempt will be the keeper.